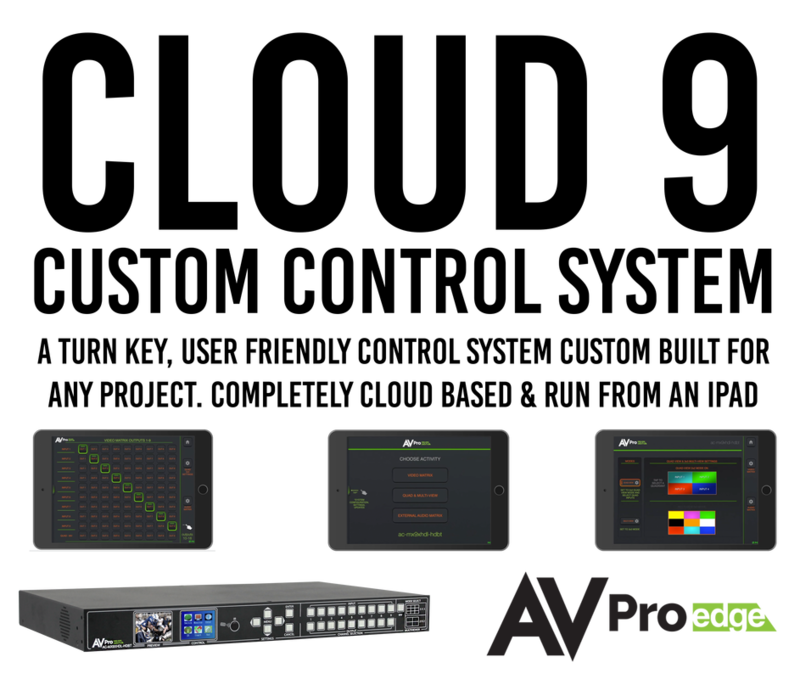 AVPro Edge brings you a complete Professional A/V Control System that is an out of the box, turn key solution and fully customizable. This is how it works; install any number of Cloud 9 switches into your system. You will have a consultation with one of our Control Specialists to find out exactly what your video and audio distribution is going to be like. We will then do everything else for you and program a complete control system. 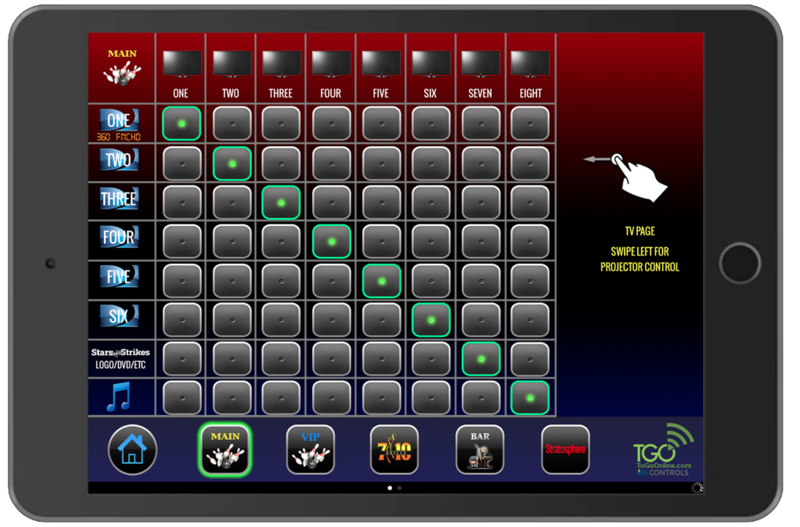 You can then access the control by using an app on any iPad, NO CONTROL HARDWARE NECESSARY. That iPad becomes your complete remote control, and all you had to do was answer a few questions about your sources and displays. Also with added support like year long support for an additional $300.00, you won't have to worry if something needs to be renamed, changed or moved through out the year. 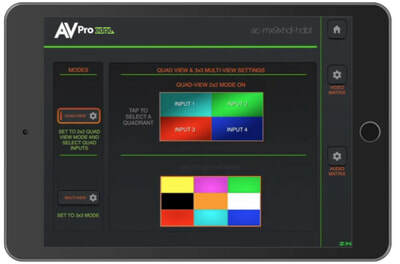 This eliminates you having to worry about control hardware, drivers, programmers, custom commands and everything thing else that goes with putting together a professional A/V control system. Our control systems start at $2500.00, call today to talk to an AVPro rep for more details. Stop spending time setting up a control system you don’t understand. 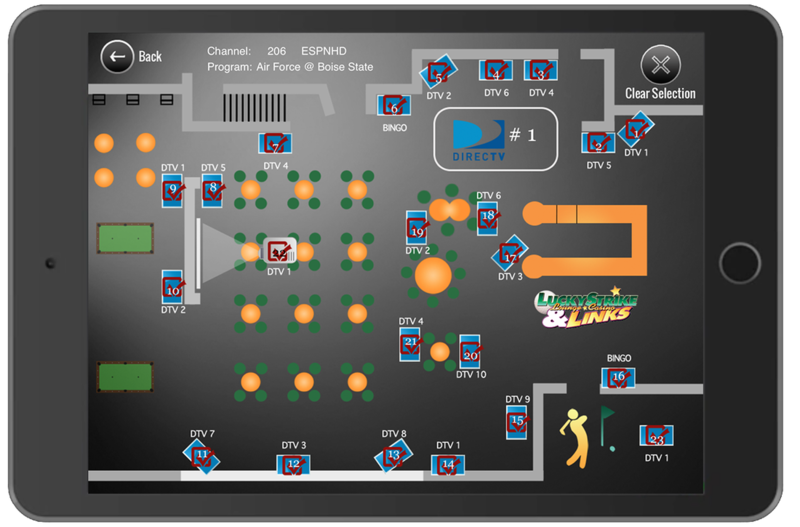 AVPro Edge offers an all-in-one solution for restaurants, sports bars, classrooms, and everything in between. Our turn-key solution is unlike any other. We’ve done the programming for you to provide your clients with a full featured, state-of-the-art control system. This exclusive control system is custom designed specifically for AVPro Edge’s Cloud 9 Matrix allowing you to take full advantage of all the major functions this powerful product is capable of. 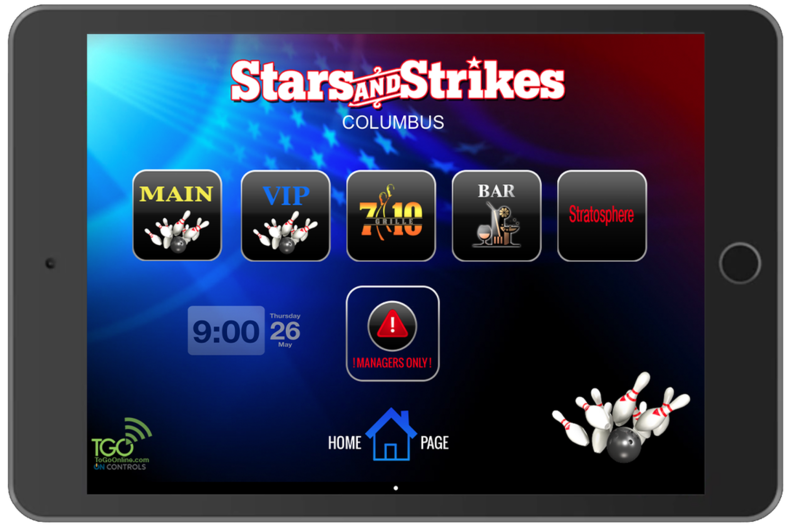 Setting up your complete system is as simple as installing your Cloud 9, connecting your displays and downloading an app on your iPad. Sign in with your custom AVPro Account, and you and your client are ready to go. 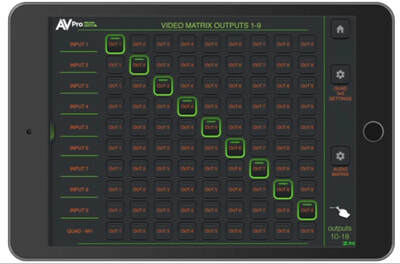 Complete Video and External Audio Switching Matrix: Choose any combination of inputs and outputs, or select a single input to send to all outputs including quad-view and multi-view video inputs. 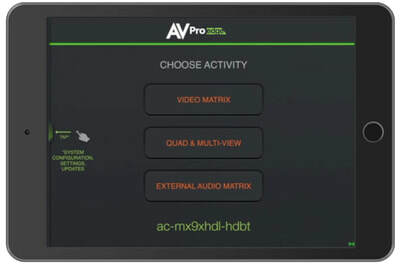 Easy Quad-View and Multi-View settings: Mix and match all 9 video sources in any quad-view combination. Easily switch between quadview(2x2) and mutli-view (3x3) modes. Display Power Controls via RS-232, IP, and IR: Works seamlessly with other control systems without interference. DirecTV Control and Tuning Feedbacks: If you are using DirecTV, you can control each receiver and see the tuning info right on your Cloud control system. 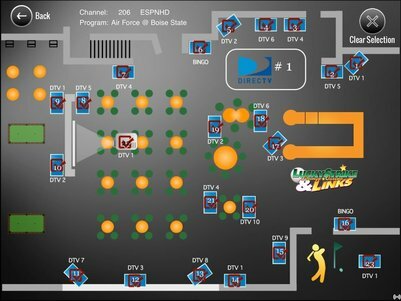 Customized Floor Plan Options: Tailor your installation with a matching custom control floor plan and graphics/logos. Built just for your client! 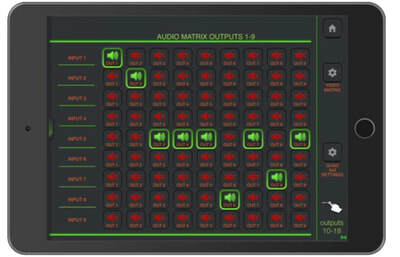 AIMS: "Actual Instant Matrix Switching" allows the Cloud 9 to instantly display any of the sources on any display with no delay from button push to switch. 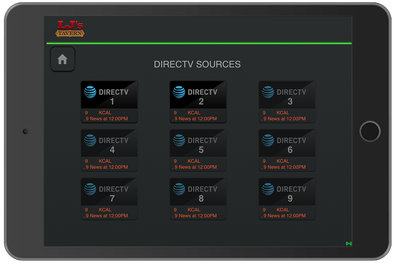 Additionally, AIMS allows you to switch in and out of multiview mode instantly. MATRIXABLE QUAD-VIEW: This function allows you to utilize a larger display or projector to show either one source at a time or 4 sources at a time. 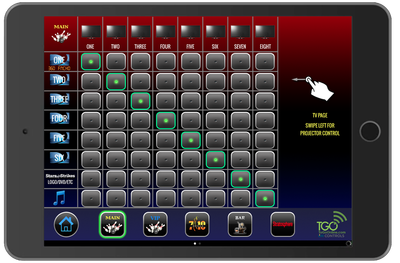 In this mode you can matrix each quadrant individually or display one source full screen...all instantly. 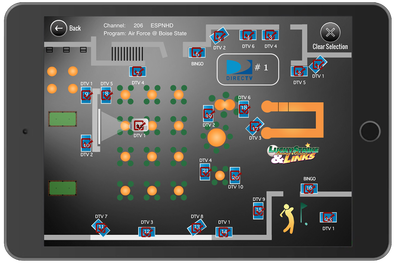 9-SOURCE MULTIVIEW: View all 9 sources on any display, ideal for large projectors, confidence monitors and eye catching dynamic video walls with a DigiBird Processor. 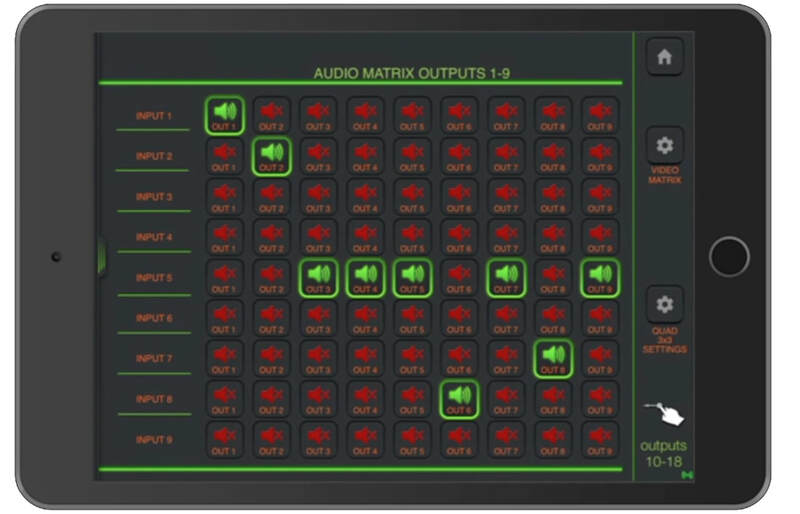 IR & RS-232 MATRIX & DISPLAY CONTROL: Not only can you control the matrix itself with these protocols, you have the ability to control the displays/projectors for things like power on/off without running extra wires. This often overlooked feature is fully implemented in the Cloud 9. CASCADE: Increase the size of you matrix to limitless proportions by simply adding additional units. They only take up 1U rack space and each unit adds 9 more outputs to your system. FPGA BACKBONE: We get asked all the time how is this possible with traditional HDMI distribution methods, and the answer is simple. While it feels simple to the installer, tons of things are happening at once behind the scenes. The signal is managed by our FPGA Modules which make for very robust mission critical installations. Our FPGA Engineers are among the best in the world and the Cloud 9 reflects this. For Cloud 9's product page click here. To Purchase the Control System click here.